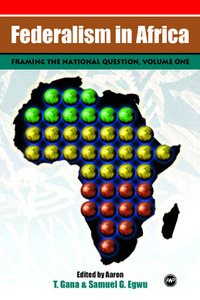 This two-volume book series is included among the various text layout/formatting and index projects done for the sister companies, Africa World Press and The Red Sea Press, Trenton New Jersey available for order on the companies’ website- http://www.africaworldpressbooks.com/servlet/StoreFront and all major online retail stores including amazon.com and Barnes and Noble. This is book is the first attempt at a scholarly historicisation of the African crisis of development. It interrogates the problem of national integration within the context of ethno-religious and cultural pluralism. Drawing on the experiences of other organic “federal societies” across the globe, it explores similarities and differences in the tortuous trajectory of nation-building and presents exciting prospects for the resolution of the National Question. Here top scholars offer refreshing insight into the prospects for transforming Africa into the a super-power of the third millennium. The breadth and depth of coverage and analytical rigor unite the essays and produce one of the most comprehensive and authoritative treatment of the subject in recent years.